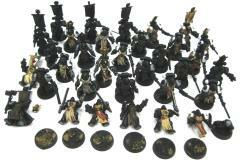 All of these figures have been assembled with parts from the Black Templar Chapter Upgrade Pack. All figures are in various stages of painting and a few of them are broken. All figures shown are included in this lot.